Fred Weasley and George Weasley were identical and mischievous twin wizards born on 1 April, 1978 to Arthur Weasley and Molly Weasley (née Prewett). Brilliant pranksters, they co-founded and ran the joke shop Weasleys' Wizard Wheezes and were members of both Dumbledore's Army and the Order of the Phoenix. Fred: "He never managed to get all the words out, due to the fact that we forced him head-first into that Vanishing Cabinet on the first floor." Hermione: "But you’ll get into terrible trouble!" Fred: "Not until Montague reappears, and that could take weeks, I dunno where we sent him." The twins departed from Hogwarts sometime after the Easter Holidays in 1996 in a final act of rebellion against Dolores Umbridge and the Inquisitorial Squad. After leaving school, the twins went on to open their joke shop, Weasleys' Wizard Wheezes, which was made possible because Harry Potter had given them his Triwizard earnings. All the products in the shop were mainly of their creation. The twins were famous for their pranking and mischief at the school. They were also very brotherly-like figures to Harry Potter, giving him the Marauder's Map and playfully teasing him. They were skilled in magic and created an entire line of magical joke items known as "Weasleys' Wizard Wheezes". According to their brother Ron, they had good grades, but they only received six O.W.L.s combined. Both of them played as Beaters on the Gryffindor Quidditch team. George Weasley was devastated by the tragic loss of Fred Weasley in the Battle of Hogwarts. Fred Weasley — Brother of Bill, Charlie, Percy, Ron, and Ginny, and son of Molly and Arthur Weasley. Twin brother of George Weasley. "Rapier" and "Rodent" on Potterwatch. Died in the Battle of Hogwarts on 2 May, 1998. George Weasley — Brother of Bill, Charlie, Percy, Ron, and Ginny, and son of Molly and Arthur Weasley. Twin brother of Fred Weasley. Lost an ear in the Battle of Seven Potters. George survived the Second Wizarding War and went on to marry Angelina Johnson and have two children, Roxanne and Fred (named after his late brother). James Phelps has played the role of Fred Weasley in all films to date. Oliver Phelps has played the role of George Weasley in all films to date. 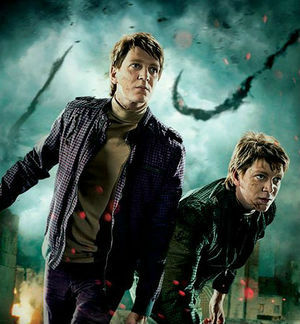 James and Oliver Phelps have admitted to having to reshoot some of the scenes because of them swapping roles without anyone realising. J. K. Rowling has said that Fred and George are among her favourite characters. Fred and George, both being pranksters, were rather fittingly given the birthday of the 1st of April, commonly known as April Fool's Day. Fred and George both have the same first letters (of their first names) as their maternal uncles, Fabian and Gideon Prewett, who may, though it is uncertain, also have been twins. Fred and George were the only sons of Arthur and Molly Weasley who did not become prefects during their education at Hogwarts School of Witchcraft and Wizardry, and hence Percy's disparaging reference in his letter to Ron concerning "what we might call the "Fred and George" route". This page was last edited on 1 July 2015, at 09:23. This text is available under the GNU FDL and may have been adapted from the Wikipedia article about Fred and George Weasley (history).